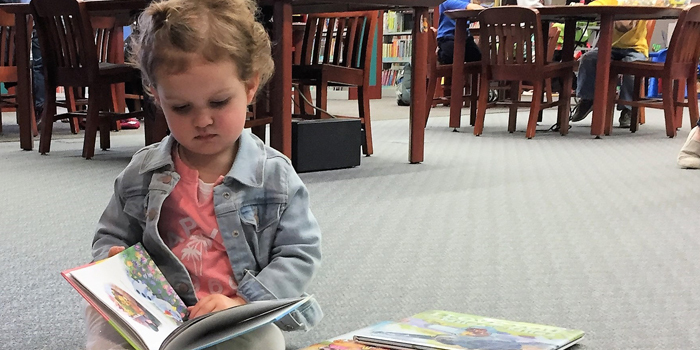 Piper Horne enjoys visiting the Warsaw Community Public Library. We in the Children’s Department at the Warsaw Community Public Library are excited about an upcoming anniversary. Children’s Book Week will be celebrating its centennial at the end of April, and we are preparing to make a big deal of it. Children’s Book Week is an annual celebration of the joy of reading children’s books. Beginning in 1919, it is the longest-running national literacy initiative in the United States. Children’s Book Week was started by Franklin K. Matthiews, the librarian of the boy Scouts of America. He also enlisted the help of the editor of Publishers Weekly, who believed that “a great nation is a reading nation” and the superintendent of children’s works at the New York Public Library. In 1944, the newly-established Children’s Book Council took over the administration of Children’s Book Week, and in 2008, passed it on to Every Child a Reader, CBC’s charitable arm. This group assumed responsibility for planning official events and creating original materials. They also work with established authors and illustrators, which makes the yearly events even more exciting. Every year, events are held in schools, libraries, bookstores, and homes across the nation, connecting young readers with books tailored to their interests and needs. To celebrate this year, we are preparing a late afternoon of fun for all ages. Join us from 5 to 6 p.m. Monday, April 29, for a program featuring the best in children’s literature from the last 100 years. Cookies will be served so we can figure out what exactly happens when you give a mouse a cookie. Do you know what can be created with a single purple crayon? Goblins aren’t all bad, are they? One attendee will win a free book and all are invited to join us for an optional craft after the event. For more information, come in and see us at 310 E. Main St., Warsaw, or contact us at (574) 267-6011 and on the web at warsawlibrary.org.